Which is the best drywall panel hoist lift in the market today? Compare these top rated drywall panel hoist lifts to see which is the best one for you. Do you know what the most important elements are with a drywall panel hoist lift? You want to make sure that it is sturdy, because you don’t want it tipping or falling over. You are going to be using it as your building partner, so you want to ensure that it can be operated by one person. 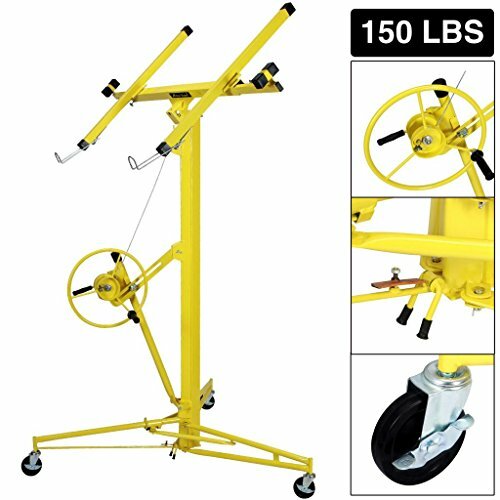 You want your drywall lift to crank and lift easily so that you don’t have to work hard. You want it to be easy to assemble and take down so that you can move it from job to job. And… can hold multiple drywall sheets when working with a partner – so that you don’t have to go up and down all the time. When working alone, you want it to tilt to hold the drywall in place while you nail it in. Great for both professional job sites and home renovations. We chose these nine drywall lifts based on research and customer feedback and reviews. ✅This drywall lift has over 400 reviews on Amazon. The Troy Professional drywall lift is strong and durable – widely viewed as one of the best on the market. Max reach for horizontal ceilings: 11 feet (15 feet with optional extension, sold separately). Max single sheet capacity: up to 4-foot by 16-foot. Max Reach for walls: 15 feet (determined by the 11-foot max lift and half the length of a standard drywall sheet). Max load rating: 150-pound capacity. Easy rolling heavy duty 5-inch casters. Click here to check pricing and read reviews on Amazon. One person can easily handle and install drywall panels 4 x 16 ft.
Red Line offers both an 11 foot and 19 foot hoists. Both are all welded steel construction and no tools are required for assembly or take-down. Will hold 16 foot wide sheets and can be used for walls or ceilings. The Pro-Series drywall hoist will lift up to 16 feet high. The Irontron lift will hoist drywall up to 11 feet high. 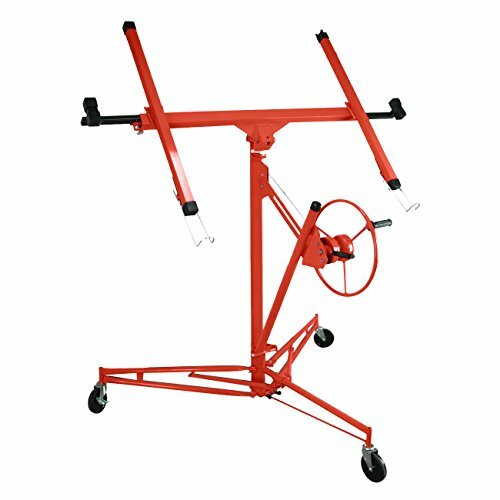 It offers different positions for wall or ceiling application as well as locking outriggers for safety. One person will be able to handle the job when using this lift. This lifter is smooth, safe and just well built! The Telpro Panellif drywall lifter is easy to assemble and disassemble with no tools. The tilting cradle brings loading height down to 34 inches for easy installation of drywall to walls. Click here to read some of the many reviews on Amazon. Goplus is available on Amazon and is getting great reviews as a low cost option. The lift is forged from heavy duty steel, which ensures it longer lasting life and sturdiness. The payload is up to a robust 150 lbs. and can be hoisted up on walls or ceilings. Base contains three wheels and helps keep the system balanced. Click here to check pricing and reviews on Amazon for the Best Choice Products lift. Ideal Choice drywall lift is a Best Seller on Amazon for its low cost, ease of use and durability. 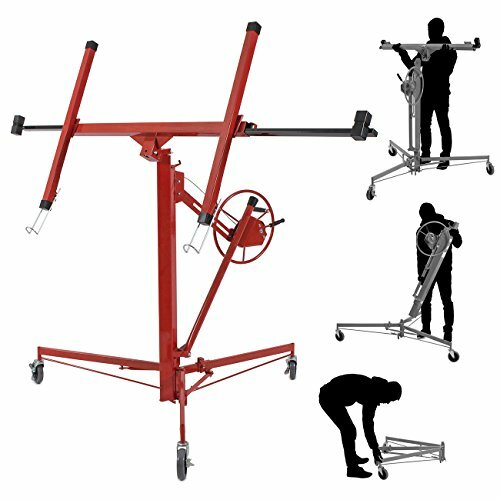 If you want to extend the height of your drywall hoist, you will need to get the extension that matches the make and model of the hoist you own. 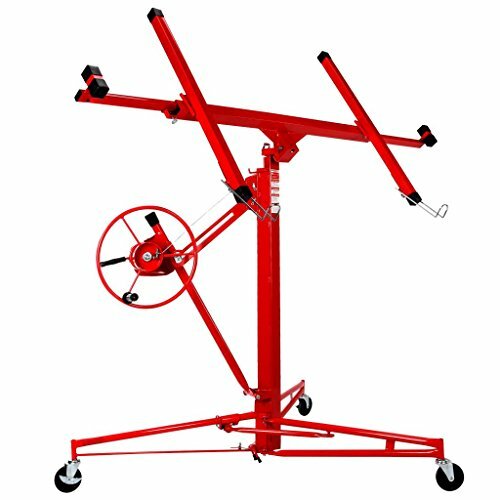 ✅ What is the Best Heavy Duty Drywall Lift Hoist on the Market? If you can afford it, the best heavy suty drywall lift hoist would be the Pentagon. This investment will last you for years and you will be happy with how easy it is to use and how durable and sturdy the components are. Finding it on sale is tough, check this page on Amazon periodically for pricing. After reading all of the reviews online, the Ideal Choice has hundreds of positive reviews on their price, durability and easy of use. 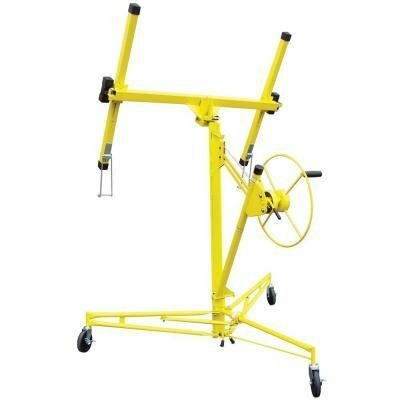 Rent or Buy a Drywall Panel Hoist Lift? Many people wonder if they should rent or buy a drywall panel hoist lift. The answer depends on your requirements. If you need the hoist for just one day, then it is more cost effective to rent the lift. If your project is going to run over the span of a week or more, then you might want to purchase as your rental costs will be greater than the purchase price. When you are finished with your project, you can sell the lift. 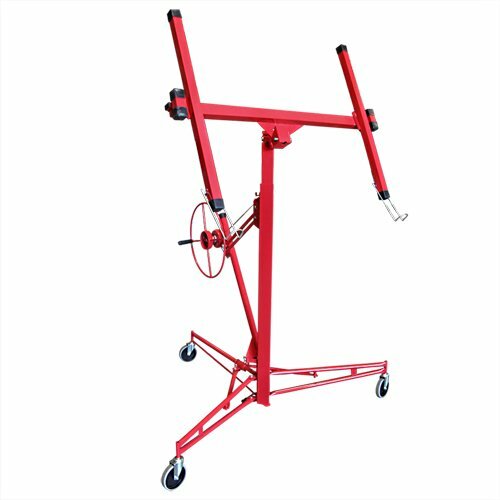 If you have a professional requirement, then buying in the answer as you will use the drywall lift jack over and over again.